A lot of times you’ll hear a life coach or conflict mediator talk about getting someone on “the right track.” I never was particularly fond of this term because there is not just one right track, but many possible tracks that could be right for you. There are many avenues on which we can find happiness; we are forever at the foot of thousands of different trails which lead to thousands more. 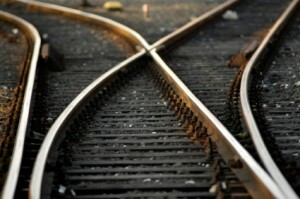 Life can go in so many different directions that it makes the notions of “right track”/”wrong track” almost irrelevant. The less we expect from the track we’re on the more we glide down it without any anxiety of whether it’s living up to our expectations. Of course, I’m not diminishing the importance of personal assessment and goal setting. I would just encourage those reading this that your pathway to where you want to be is a lot more multifarious than we might think. But a bigger problem about a life coach “getting you on the right track” is that it implies that the coach knows what the right track is to begin with. You can no more expect a life coach to swoop down and determine the right track than you can reasonably expect a man to propose to a woman after only three minutes of knowing her. Ultimately the paths a client takes is revealed and decided by the client himself/herself; not the life coach. The life coach clarifies the circumstances of his client’s life, so that the client himself can lucidly decide what pathways to take toward the life they envision. Life coaches don’t have magic wands—they harness the magic power we all have to make our own decisions, which lead to a better life. I would avoid a life coach who, on the first session, is telling you what you need to do to become the person you want. In other words, any life coach who tells you what the right track is probably isn’t going to get you to where you want to be. Call my office at (212) 599-3195, and we’ll get your life rolling on all sorts of tracks. You won’t look back.